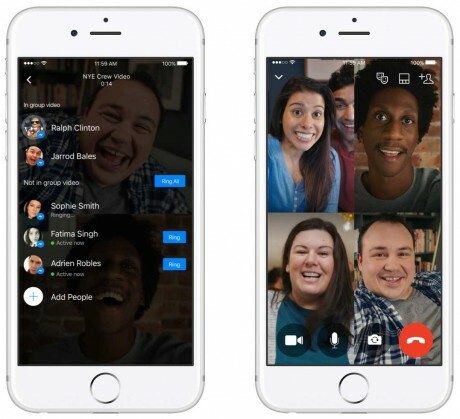 Facebook today launched group video chats within Messenger. The tool will allow up to six participants to view one another in a live video call. People can easily initiate calls within existing groups or by creating new groups. Tapping a video button is all that's required to kick off a video group chat. Facebook says people can ring the entire group at once, or just select numbers before inviting others. The feature is rolling out to Facebook Messenger for Android and iOS devices, as well as the web, globally. The app is free to download from the Google Play Store and iTunes App Store. Video calls are free over WiFi, but will use data if conducted over cellular networks. Facebook today expanded the tools people can use to manage large group chats in Messenger. Administrator privileges allow people to approve new members before they can join a group chat, as well as remove members and promote/demote another user to/from the role of admin. Facebook today made its slimmed-down messaging app a bit more powerful with the addition of video chatting. Facebook calls video chats "an expected and essential part of everyday communication" and the company is pleased to offer the functionality to users of the Messenger Lite app. Facebook today revealed a new version of Facebook Messenger featuring a cleaned-up user interface that the social network hopes people will find more appealing. To start, Messenger 4 will dial back the number of tabs from nine to three with an emphasis on existing one-to-one and group conversations.